Glacier Lagoons at Vatnajökull Glacier? 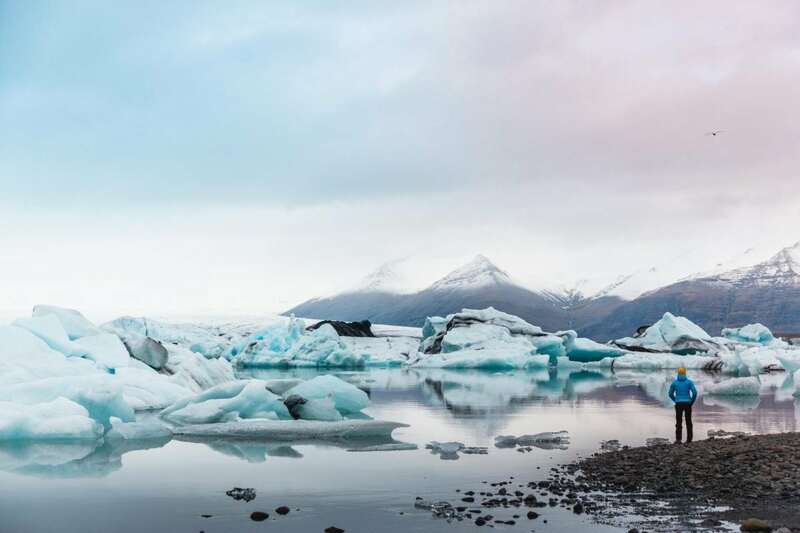 Iceland’s glacier lagoons are some of the most extraordinary natural wonders in the world. Out of many ice lagoons, Jokulsarlon is by far the most famous tourist attraction. Its visitors refer to it as a major highlight of their trip. Together with the beautiful Diamond Beach, these sites are the most photographed places in Iceland. 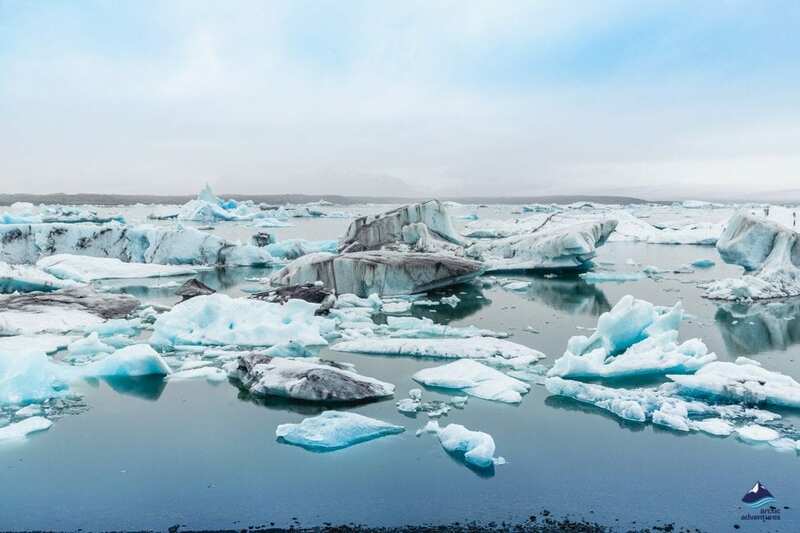 Glacial lagoons, glacier lagoons – or glacial/glacier lakes as they are also referred to – form at the point where a melting glacier reaches sea level or a lowland plateau. As the glacier tongue slowly retreats year by year, it leaves behind a depression in the ground which then gets filled up with meltwater. There are numerous spectacular glacial lakes in Iceland, read our comprehensive guide to learn more about them! At some glacier lagoons where the ice directly reaches the water, huge chunks break away from the glacier’s tip and end up floating in the lagoon. These ice bits vary largely in size and shape, from small diamond-like pieces to gigantic icebergs as large as 20-30 meters (65-98 feet). The color of an iceberg depends on its texture but we most often see beautiful cyan-blue icebergs in these lagoons. Glacial ice is formed slowly over hundreds of years by compression under a huge weight. During this process, the air gets pushed out of the ice making it possible for light waves to travel very deep inside the ice undisturbed. As ice absorbs red spectrum light and reflects more blue, this causes us to see these icebergs as blue. 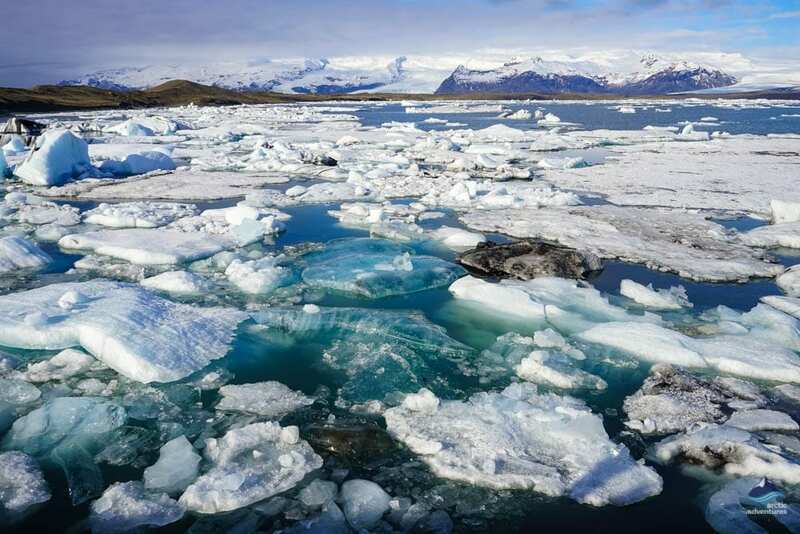 However, when their surface starts to melt, air begins to enter the ice, slowly changing the color from blue to white. 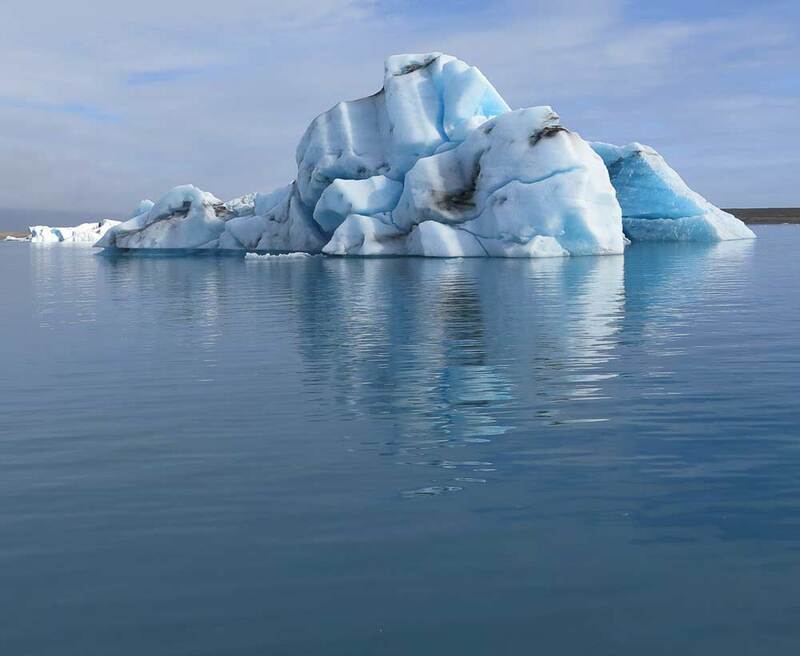 When a white iceberg flips over, the part that was previously underwater appears to have become blue again since that part did not have contact with the air. This is why icebergs may seem to constantly change color. We quite often see the ice with brown and black stripes or pieces that are entirely dark. Each of these black layers represents the ash of a violent volcanic eruption captured in the ice. The brownish stripes were probably caused as the glacier traveled downhill and picked up sediment along the way. We rarely see greenish stripes as well which are formed in algae-rich water. Glacier lagoons never look the same. They vary in size, water color, and the size and quantity of the icebergs that they contain. The seasons, air temperature, and wind affect the melting speed as well as the movement and appearance of the icebergs. The appearance of a glacial lake can change completely overnight. 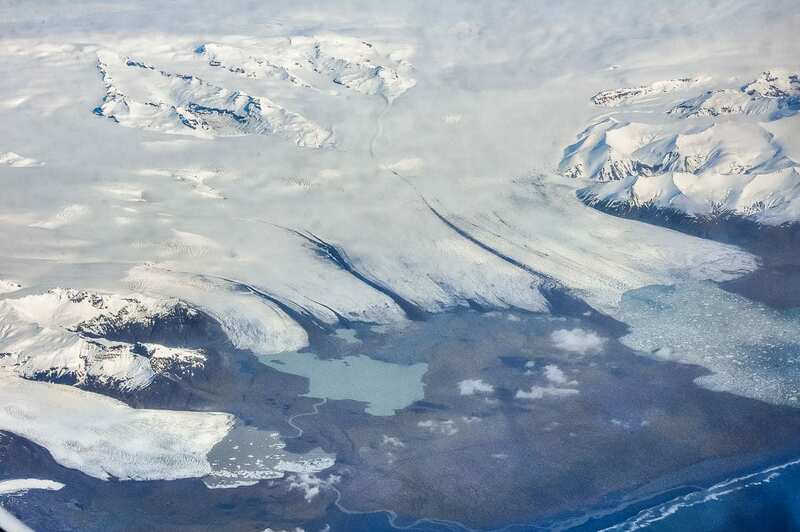 Over the last decades, Iceland’s glacier lagoons have expanded a lot. Jökulsárlón, in particular, has more than doubled in size since 1970 and continues to grow. This means that the glacier it comes from is retreating rapidly. The glaciers in Iceland are melting at a dramatic pace. They have shrunk by 2,000 square kilometers (1242 square miles) since the end of the 19th century of which 500 square kilometers (310 square miles) have happened since the turn of the 20th century. 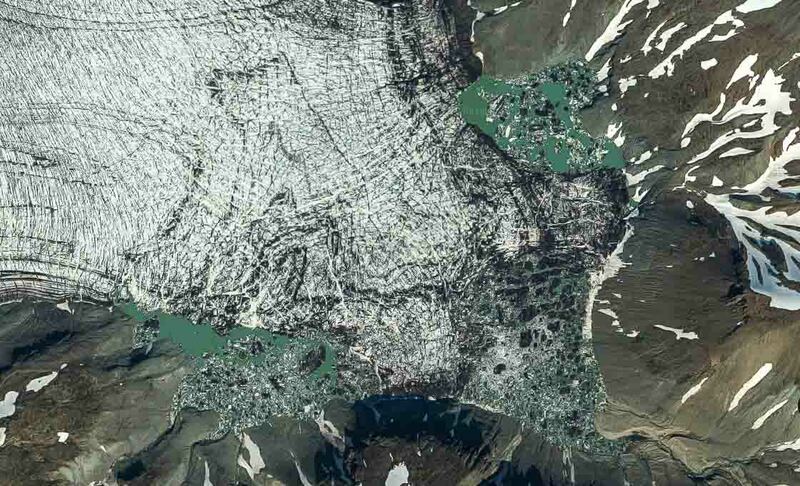 Many of today’s glacier lagoons did not even exist a few decades ago. According to scientists, Iceland’s second largest glacier, Langjökull, will lose 85% of its volume by the end of the century. It will completely disappear in 150 years if the current trend holds, probably leaving a giant lake behind after all the ice has melted. Vatnajökull is the largest glacier in Iceland and has numerous outlet glaciers that end in a glacier lake. Many of these lagoons are relatively easy to access. They are found along Iceland’s South Coast, closer to the eastern part of the Vatnajökull Glacier. 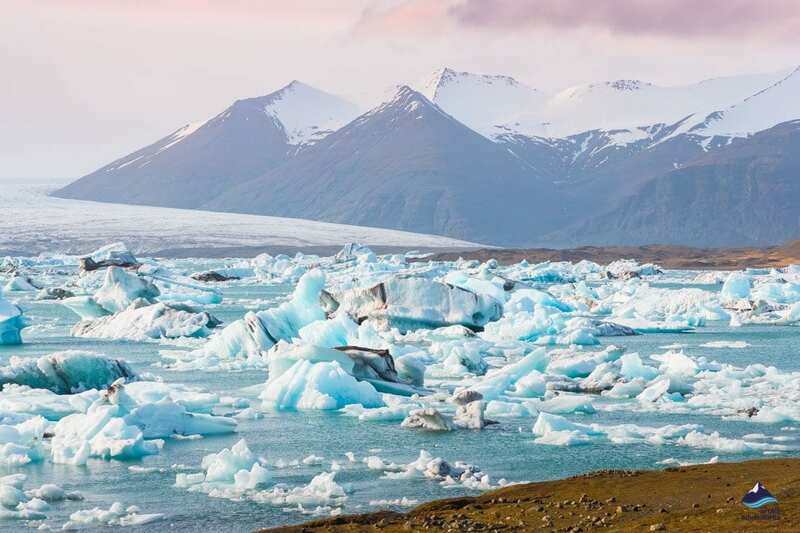 These are Iceland’s most well-known glacier lagoons. Jökulsárlón is the most famous glacier lagoon in Iceland and many refer to it as the crown jewel of Icelandic nature. It is, indeed, incredibly breathtaking and also the most unique of all the glacier lagoons in Iceland. Jökulsárlón is connected to the sea via a narrow channel, therefore its water is more clear and bluer when compared to other glacier lagoons. What also makes Jökulsárlón different from other lagoons is the shape and the size of the icebergs. 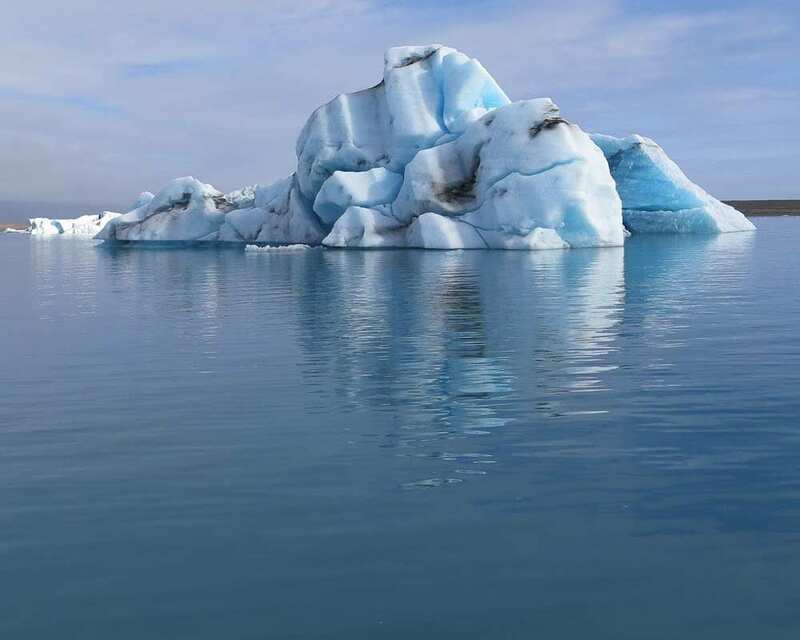 Due to its direct connection to the sea, most of the icebergs do not spend much time in the lagoon itself. They float across it, following the gentle current to the ocean. 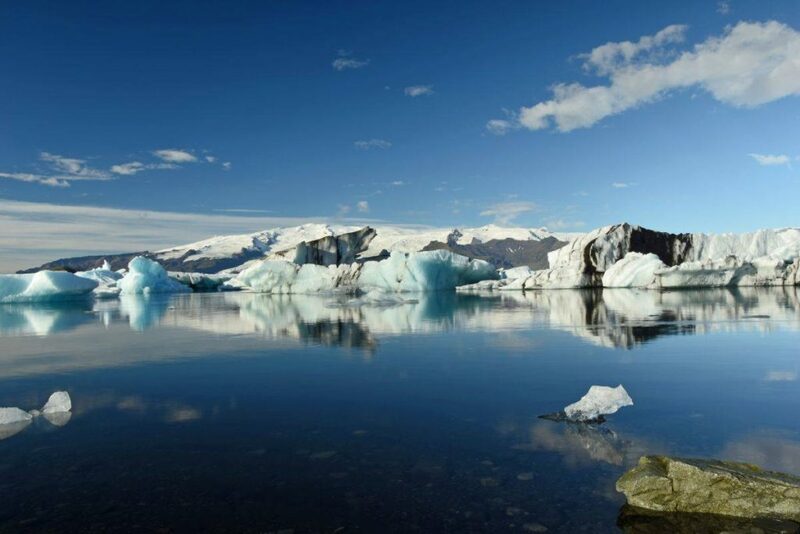 At other lagoons, there is no way out for the icebergs, so they become stranded in the lagoon and disappear gently. 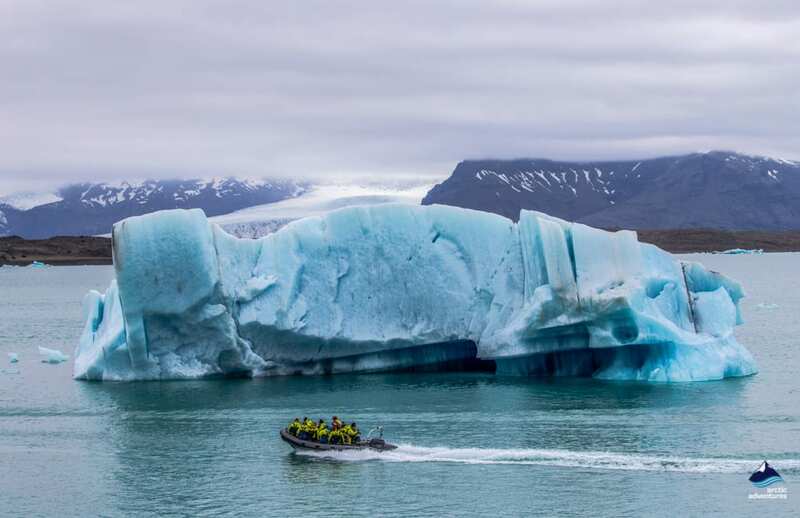 This means that you will see much flatter icebergs at lagoons other than Jökulsárlón. Uniquely at Jökulsárlón, the giant glacier pieces make their way to the ocean where they end up breaking into a million pieces on the seashore. 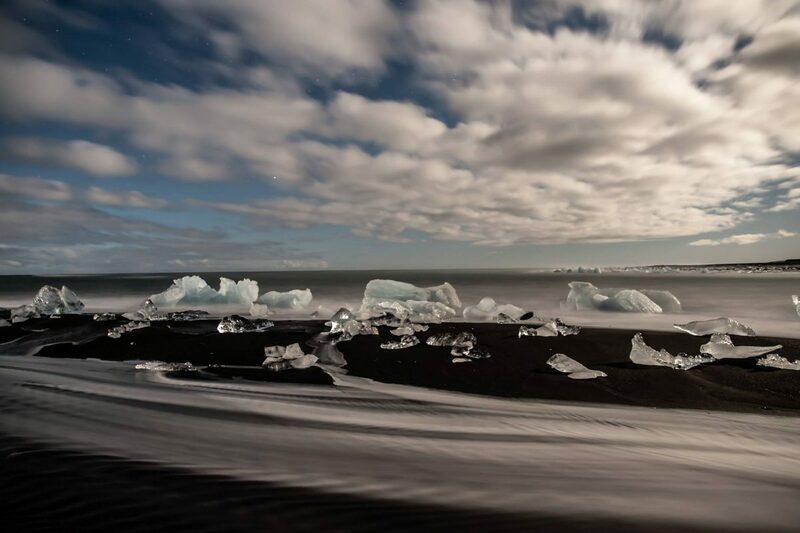 As the waves push them back onto the coast, they create a beautiful black sand beach with sparkling ice rocks decorating the coastline for hundreds of meters. 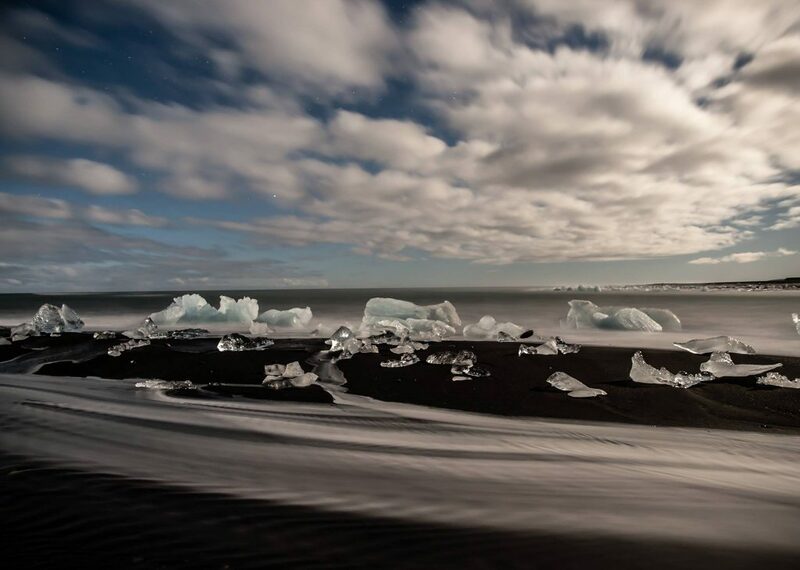 This place is nicknamed “Diamond Beach” and is one of the most photographed natural attractions in Iceland. 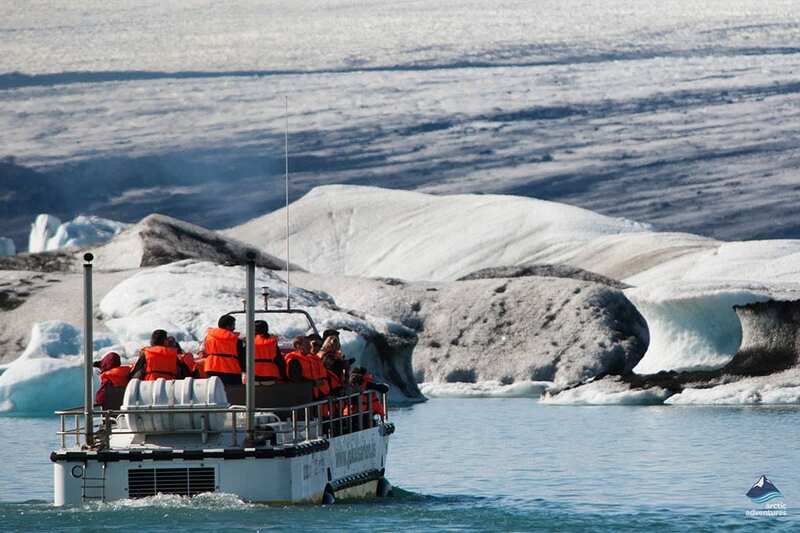 Jökulsárlón is not only the largest lagoon that features floating icebergs but also the easiest to access. 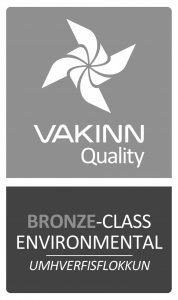 It is located 5 hours’ drive from Reykjavík, right next to the famous Ring Road that circles Iceland. The main road literally cuts through the lagoon with a bridge. 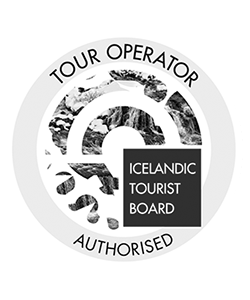 Thanks to this, Jökulsárlón is the most visited of all the glacier lagoons and is also one of the most popular tourist destinations in Iceland. Jökulsárlón glacier lagoon is accessible year round, with summer being the best time to visit. 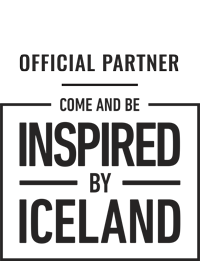 It is a major destination for many day tours and multi-day tours all year. Between June and September, amphibian boat tours, zodiac boats, and kayaking tours operate on the lagoon. 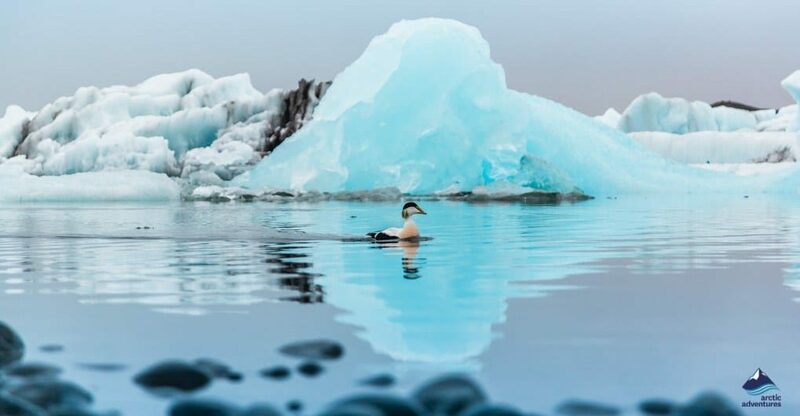 They offer the rare opportunity to explore the giant icebergs and the tip of the glacier as it “calves” into the water from up close and personal as well as to observe the playful seals in their natural habitat. In the winter, even though the boat trips do not operate, the place has even more charm with fewer tourists and the stunning colors of the low winter sun. Here, you will also have a pretty good chance of catching a glimpse of the Northern Lights when it is dark. A winter visit also means you can explore the natural ice caves that can be found on the nearby Breiðamerkurjökull Glacier. These crystal ice caves are short-lived wonders as they are only accessible between November and March. Right next to Jökulsárlón are two more ice lagoons within an 8-kilometer (5 mile) drive. Iceland’s second most famous glacier lagoon is Fjallsárlón, located only 15 minutes’ drive west from Jökulsárlón. The glacial lake belongs to the outlet glacier, Fjallsjökull. From the lakeshore, the glacier itself is much closer than at Jökulsárlón and Iceland’s tallest mountain, the spectacular Öræfajökull volcano, towers above. 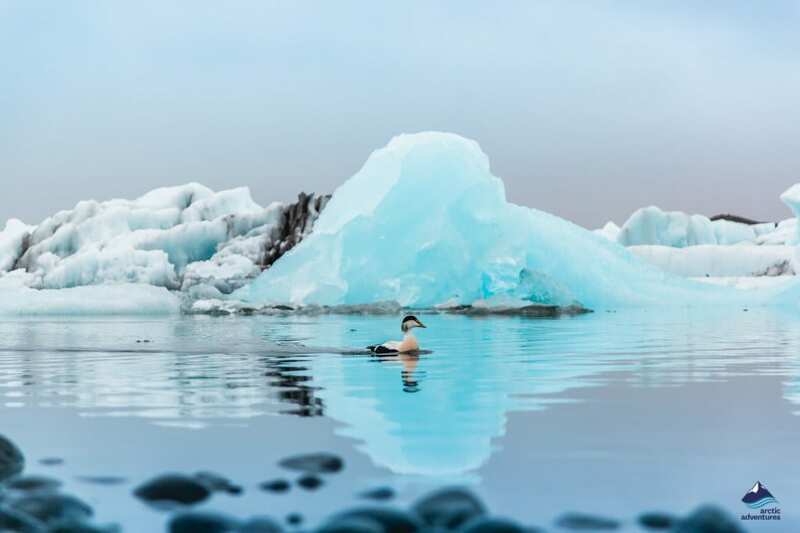 Fjallsárlón is also characterized by the beautiful glittering icebergs, showcasing them in many different shapes, sizes, and shades of blue, brown, black, and white while they float lazily atop the water. Though smaller than its neighbor and with water that is browner, Fjallsárlón has the advantage of being less well-known and thus much less crowded than Jökulsárlón. Boat tours are offered here as well during the summer and autumn seasons when the weather allows. Breiðárlón Lagoon is located in between Fjallsárlón and Jökulsárlón. It comes from the same outlet glacier as Jökulsárlón, Breiðamerkurjökull. The lagoon is somewhat larger than Fjallsárlón but is much more difficult to access than the other two. In order to see Breiðárlón, one must hike or drive a large 4X4 Jeep to be able to navigate the dirt road that leads to the lagoon. For those who would like to skip all the tourist crowds, Breiðárlón may be the best option in the area. While driving on Route 1 from Fjallsárlón to Skaftafell, you will marvel at the sight of several glacier tongues squeezing through V-shaped valleys as they slowly reach their ablation zone and begin to melt and calve icebergs. Kvíárjökull Glacier is one of the most scenic examples you will find along the way. This outlet glacier comes from Vatnajökull, just like the many other glaciers in the area, and is topped by Hvannadalshnjúkur, Iceland’s tallest peak at 2,110 meters (6,922 feet). Kvíárjökull also features a small ice lagoon with floating icebergs and is easy to access from the main road. Skaftafell is located 50 minutes west of Jökulsárlón or a 4.5-hour drive from Reykjavík. The area is part of the vast Vatnajökull National Park which is the largest national park in Europe. Skaftafell is a green valley surrounded by a mighty ice cap on three sides. The area is a haven for hikers and outdoor enthusiasts and features multiple scenic glacier tongues on which glacier hiking tours are operated year round. Two of the glacier tongues in Skaftafell have small glacier lagoons. The one at the tip of Skaftafellsjökull is located just 2 kilometers (1.2 miles) from the Skaftafell Visitor Center. It requires only a short, easy walk to get to and explore the lagoon. Svínafellslón is located 15 minutes’ drive or a one-hour hike from the Skaftafell Visitor Center. This tiny lagoon is the first thing that the glacier hikers see before heading up on the ice. The water at both of these lagoons is greenish-brown, caused by sediment. Both feature plenty of huge, brownish and blueish-white icebergs. Skaftafell features another glacier lagoon that can be found off the beaten path, deep between the mountains. 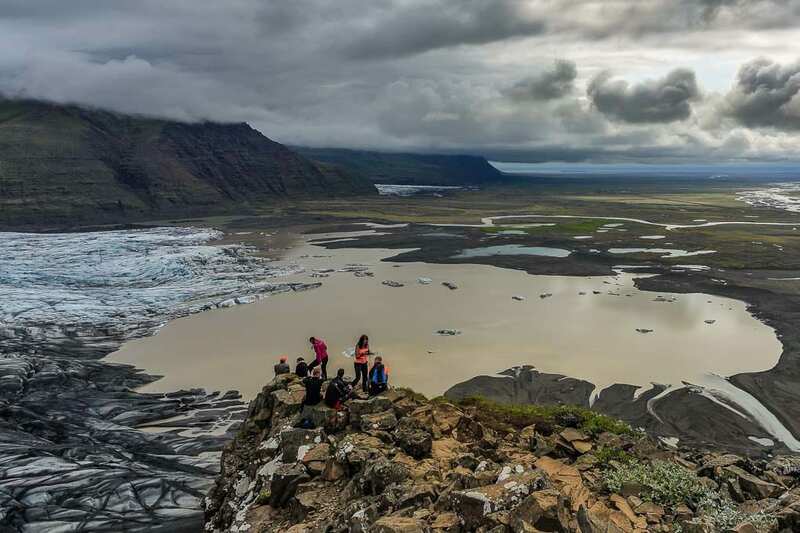 Within a 10-kilometer (12.4 mile) hike from the Skaftafell Visitor Center, you will arrive at the tip of the Morsárjökull Glacier where a beautiful glacier lagoon awaits you with Iceland’s tallest waterfall (at 240 meters / 787 feet high) in the far background. A marked hiking path leads to the lagoon. The hike is not difficult, however, it is long, therefore only recommended for experienced hikers. What may be Iceland’s most remote and most spectacular glacier lake is hidden deep within the Vatnajökull wilderness. It is not only one lake, but at least four lagoons gathered around the same spectacular glacier tip. Thousands of icebergs fill their greenish and cyan blue glacier meltwater. This outstanding place is located at the Skeiðarárjökull Glacier and is only accessible via a challenging wilderness hike from Skaftafell. The area is a well-kept secret among locals and is a favorite gem for the most enthusiastic hikers. There is little wonder why! Grænalón is a glacier lagoon located quite far up in the Highlands. It originates from the Skeiðarájökull outlet glacier and is the only glacier lagoon that is shrinking due to the thickening of the glacier. A few decades ago, it was larger than Jökulsárlón but now is only a fraction of its former self. Even though this lagoon is especially spectacular due to the impressive black stripes upon the vast glacier, there are no roads to Grænalón. That means it is only accessible by hiking or by a private helicopter tour. Solitude is guaranteed for those who venture to visit here! On the eastern part of the Vajtnajökull glacier are another few scenic outlet glaciers. These are less well-known and not often visited by foreign tourists. They are, however, considered a local secret among Icelanders. The reason for their low popularity is most likely their not-so accessible locations. They are further away from the main road and getting to them requires driving 4X4 cars with large wheels as well as hiking. These glaciers are no less beautiful than the other ones that are closer to the road. Hainabergsjökull and Hoffellsjökull are the two glaciers that feature glacier lagoons this area. They are located approximately 30 kilometers (18 miles) apart with another outlet glacier in between them which has no glacier lagoon, yet. Heinabergslón is often listed as one of the best alternatives to Jökulsárlón as it is filled with icebergs and its water is relatively clear compared to the other smaller glacier lagoons. The size of its icebergs can be especially impressive. The glacier lagoon at Hoffelsjökull is the one that is closest to the town Höfn, the capital of Southeast Iceland. The glacier tongue and the surrounding landscape are beautifully scenic, therefore the area is popular for local hikers. The lagoon is the largest in East Iceland and is filled with giant icebergs. Both Hoffelslón and Heinabergslón are off the beaten path and highly recommended for those who want to avoid the crowds. 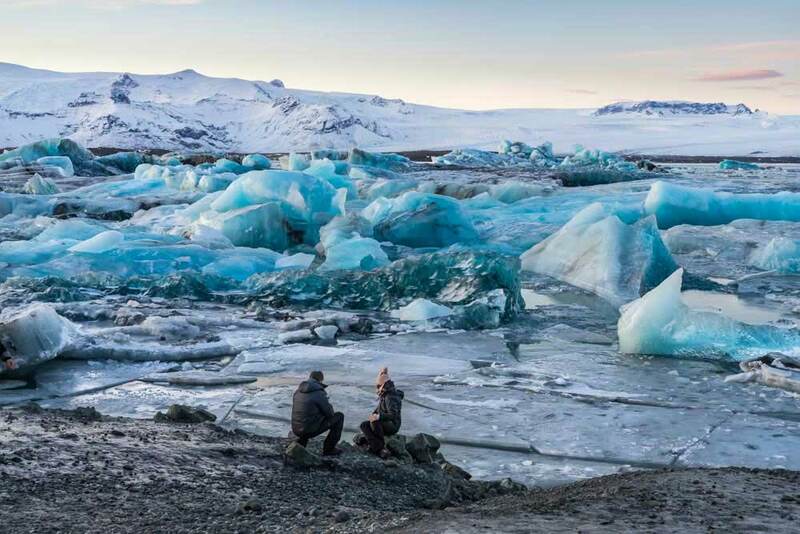 Eleven percent of Iceland’s total land area is covered with glacial ice. We have 296 named glaciers (including all the ice caps, outlet glaciers, and mountain glaciers). This means that there are basically endless opportunities for glacier lakes to form. However, not all of them will contain icebergs. The closest glacier lagoon to Reykjavík is the one found at the tip of the Sólheimajökull Glacier near Vík village in South Iceland. It is, however, more of a dirty puddle than a glacier lagoon. It is quite small and the few icebergs you can find here are mainly black and brown due to the coloration of the sediment. 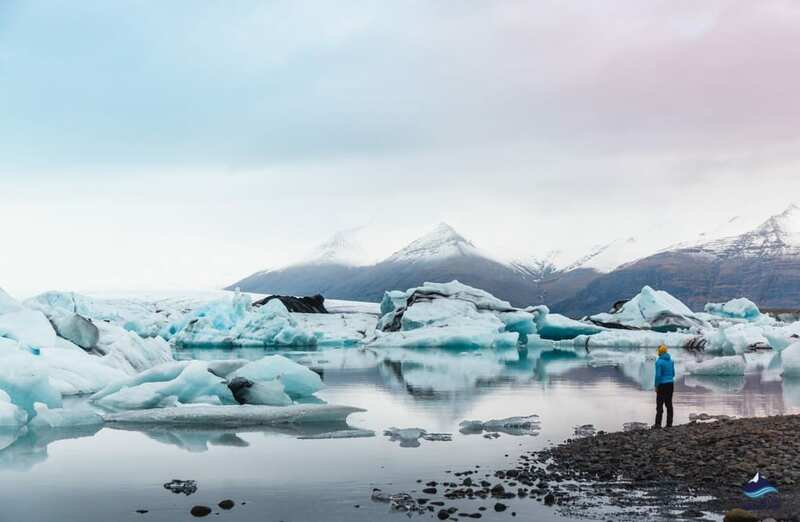 Visiting the lagoon itself may not be very satisfying, but the experience will be improved if you see it on your way up the glacier during a guided glacier hiking tour. Sólheimajökull is the closest hikable glacier to Reykjavík! Hvítárvatn at Langjökull, Iceland’s second largest glacier, is a giant glacial lake. To be more precise, it is the fifth largest lake in Iceland. Hvítárvatn, or the “White Water,” is the source of many large rivers including the Hvítá River, which features the mighty Gullfoss waterfall. In summer, it is a very popular river for rafting and river jet tours. Hvítavatn does not have floating icebergs, but on clear days, there is a beautiful view of the glacier tongue as feeds into the lake. At Iceland’s northernmost glacier, Drangajökull, there is a small lake called Kaldalón, which means “Cold Lagoon.” The glacier tongue seems to melt directly into the lake. The “calving” process has not started here yet, though, so icebergs do not fall into the lagoon. Based on climate change, however, this may happen in the coming years. 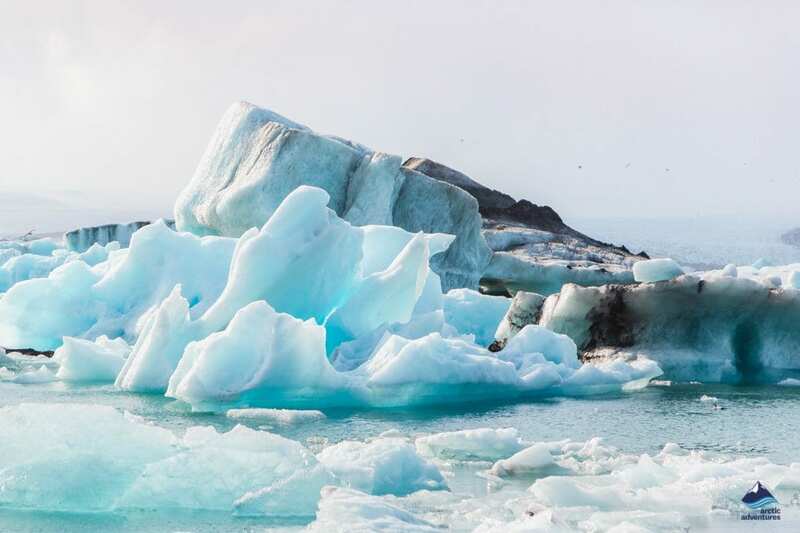 Safety should always be your number one priority, but especially when visiting glacier lagoons. The water in the lagoons and the sea is extremely cold all year round. It is cold enough to cause hypothermia in just a few minutes. Do not attempt to swim in any lagoon or in the sea. Never try to step on the ice. As some of the lagoon’s water mixes with the salty seawater, some lagoons will never freeze enough for it to be safe enough to step on, even during the coldest winter. Also, remember that the icebergs can flip over or collapse at any time. Keep your distance and keep safe. The surface of the ground is slippery in winter and sometimes can be fully covered in ice. It is better to keep your distance from the shore when there is snow on the ground as the snow can make it difficult to see where the land ends and where the water starts. 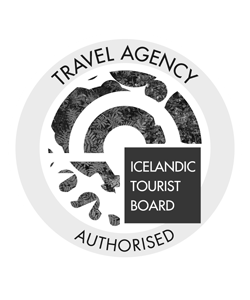 Please note that it is illegal to drive off-road in Iceland as well as on mountain roads (F-roads) with a regular two-wheel drive car. Driving to some glacier lagoons requires you to have a large 4X4 vehicle. Make sure that you look up the weather forecast and the road conditions before heading to a remote place, especially in winter. If you are not comfortable driving in wintry conditions, please choose a guided tour instead of driving yourself.